Creamy but balanced, with notes of vanilla, almond, exotic fruits, orange zest and a refreshing acidity that keeps you reaching for more. Shellfish, fish, white meat, hard cheeses. Each terroir is vinified separately. Grapes are harvested at night to preserve freshness. They are destemmed before a short skin contact or a direct pressing. Fermentation temperature is maintained between 15°C to 18°C to retain fruits aromas. Wines are blended after fermentation and then aged in stainless steel vats for 3 months. Domaine Montrose is the fruit of Coste’s family labour, a family who have been perpetuating their winemaking know-how for more than 300 years, and who lovingly work to ensure this heritage is passed on to future generations. Montrose is located in the South of France, in the Languedoc region, just a few kilometres from Pézenas and the Mediterranean. The property boasts 80ha of vines, grouped together around the estate. 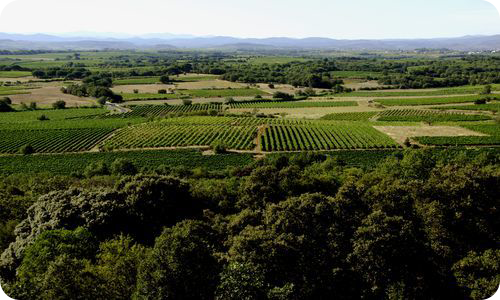 The estate is located in Côtes de Thongue, a small region made up of about fifty producers. The producers of this wine appellation have the particularity of having declined to be granted official AOC certification in order to ensure their own freedom, to be able to create their own personal wines. Montrose vines are grown on soils that are typical for this wine appellation: Villafranchiens terraces (i.e. with small Ordonnance de Joseph Alazard, ancêtre de la famille Costeround pebbles) and clay-limestone. We are also lucky to own vines located on the sides of two volcanos, Montrose and Montredon, which endow our wines with a characteristic flavour. The name Montrose appears on the first French cadastral maps, the Cassini maps, drawn up after 1756. The name can actually be traced as far back as 1696, but its origin is much older, proof of which can be found in underground cellars dating back to the 16th century. On 1 July 1701, Joseph Alazard received a crest featuring Three Lizards. Today, his descendants, Bernard and his son Olivier Coste, run Domaine Montrose. As a tribute to their ancestor, The Three Lizards appear on all Montrose bottles.